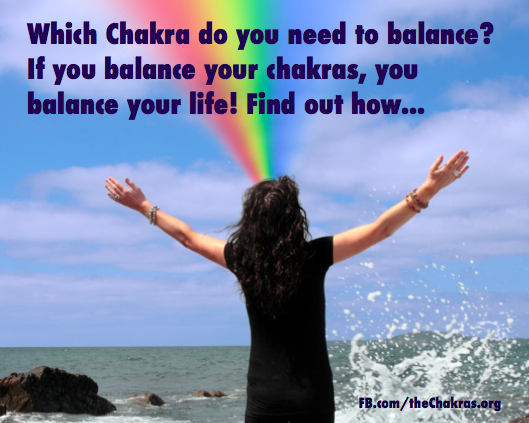 Which Chakra Needs to Be Balanced? You can use Chakra Stones to place on your body during meditation to strengthen the seven chakras. You can also keep them in the bag to ask the question, “Which chakra do I need to work on?” The stone you pick will give you the answer! Your energy body will always choose the right one. Do this anytime you’re feeling less than perfectly balanced, and want to choose a specific chakra to heal using meditation (download my free Chakra Meditation), Dynamind (see my book Balance Your Chakras, Balance Your Life or free video Balance & Tone Your Chakras), or through other means such as your diet (read The Chakra Energy Diet). 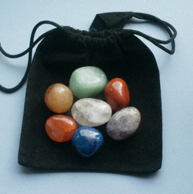 You can purchase an inexpensive bag of chakra stones at TheCrystalShop.US. Crown Chakra: Amethyst – Enhances Psychic Gifts and Higher State of Consciousness. Third Eye Chakra: Blue Aventurine – Opens the Third eye chakra and intuition. It is a powerful mental healer that increases vitality and a positive outlook. Throat Chakra: Lapis – Represents tenderness, empathy and communication. Heart Chakra: Green Aventurine – Benefits one in all areas of love, creativity, and imagination, as well as intellect and mental clarity. Solar Plexus Chakra: Carnelian – Manifests Abundance; Energizes; Heightens Self Discipline. Sacral Chakra: Orange Carnelian – Increases Concentration, Creativity, Sexuality and Courage. Root Chakra: Red Jasper – Emotional Protection, Assists with Grounding and Helps to Maintain Boundaries. THE CHAKRA BRACELET ENHANCES THE EFFECT OF DYNAMIND TAPPING. I’ve been asked about the chakra bracelet that I wear in the photos in my new book, CHAKRA SECRETS, as I demonstrate the Dynamind process for relieving pain and dis-ease, and balancing and toning the chakras. ROOT CHAKRA: Red Jasper: Courage, protection, survival, justice, stamina, endurance. SACRAL CHAKRA: Carnelian: Energy booster, speeds metabolism, passion, confidence, relieves depression, insomnia, infertility, menstrual cramps, impotence, asthma, kidneys. SOLAR PLEXUS CHAKRA: Golden Quartz: Relieves anxiety, panic, laziness, depression, aligns all the chakras, amplify and transform energy, personal power, self esteem. HEART CHAKRA: Green Aventurine: A multi-purpose healer used to bring more money into your life, make decisions, reduce anxiety and depression, bring career success, dissolve blockages, protects against negativity, asthma, lung problems, inflammation, fever, helps the nervous system, adrenal glands, heart, excellent for the skin, acne, allergies, cleanses the body of toxins, germs and bacteria, hormonal imbalances, headaches. THROAT CHAKRA: Lapis Lazuli: is a stone of truth, bringing truth to a situation when needed. If you have trouble organizing your life, carry or wear a lapis stone as it helps one get organized. It increases your channeling abilities so you can receive the answers you need. Helps with bone marrow, broken bones, fractures, throat issues, vertigo, dizziness, ear problems, learning problems, menstrual problems, the thyroid, fever, asthma, insomnia, It helps the body detox and stimulates the immune system, helps repair muscles, reduces blood pressure, and assists with depression. THIRD EYE CHAKRA: Sodalite: Brings peace and harmony, allows you to meditate more effectively as it helps calm the thoughts, eases fears, assists in healing weight issues, high blood pressure, throat problems, digestive issues, thyroid, diabetes, metabolism. colds, offers protection from electromagnetic smog. CROWN CHAKRA: Amethyst: Increases intuition, focuses energy to where it is needed, protects against addictions, negative energies, nightmares, insomnia, back pain, digestive problems, arthritis, skin problems; blisters, itching, dermatitis, sunburn, acne, migraines, high blood pressure, neck and muscle tension, stimulates the immune system. All ten winners in our CHAKRA SECRETS GIVEAWAY will receive a Chakra Bracelet as well as a signed, first-edition copy of Chakra Secrets. Enter to win by Wednesday, September 12th, at www.thechakras.org.